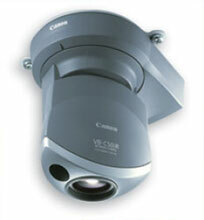 The Canon VB-C50iR has been discontinued. No direct replacement is available. Originally created to meet the specialized needs of the security industry, the reverse-mounted VB-C50iR delivers high-quality video from far distances and under the dimmest lighting conditions. Building on Canon's long-standing tradition as the leader in optics and image processing, the VB-C50iR offers greater flexibility in the most demanding environments. The VB-C50iR is perfect for professional-grade installations, providing a secure and sturdy connection interface. Now, with the addition of two-way audio capability, the VB-C50iR is now ready for a wider range of users, with security monitoring, telemedicine, distance learning, webcasting, and video conferencing among the options. Capturing subjects beyond the scope of the naked eye, it breathes new life into the world of monitoring.